What is Cervical Discectomy and Fusion Procedure? Cervical discectomy and fusion procedure is a surgical procedure intended to remove the degenerative disc in the neck portion. After removing the disc a bone graft will be inserted in the space between lower and upper vertebrae of the removed disc to fuse them together. A discectomy will be suggested by the physician only if the conservative methods of treatment have not yielded any fruitful results in relieving the pain in your neck or arm. Patients who undergo this surgery can go home on the same day itself and its takes about four weeks for complete recovery. For whom cervical discectomy and fusion procedure is needed? 1) For persons who have been found to have degenerated or herniated disc through diagnostic methods like CT scan or MRI scan. 2) For patients whose symptoms have not reduced even after undergoing conservative therapy or medication. 3) For patients who have considerable weakness in their hands and for whom arm pain is worse than neck pain. It has been found that there will be considerable decrease in the symptoms after undergoing conservative treatment for long period. Only less than 10 % of the patients will be having continued pain even after undergoing the conservative treatment for a period about six weeks. Considering all these factors your surgeon will advice you what to do and you are the person to take a final decision in the matter. What are the pre-surgical tests befor Cervical discectomy and fusion procedure? You will be subjected to pre-surgical tests several days before the appointed time for the surgery. Inform the surgeon about the medications that you are now taking and inform all the details regarding the allergies, anesthesia reaction, habits of smoking etc so that necessary precautions can be taken by the surgeon. Some medications will have to be stopped as suggested by the surgeon. Stop taking blood thinning and anti inflammatory drugs one or two days prior to the date of surgery. Stop smoking and consuming alcohol one or two weeks before the date of surgery. On the day of surgery, shower using anti bacterial soap. Use loose fitting dress and avoid high healed foot wears. Do not bring valuables, gold, diamond etc to hospital. 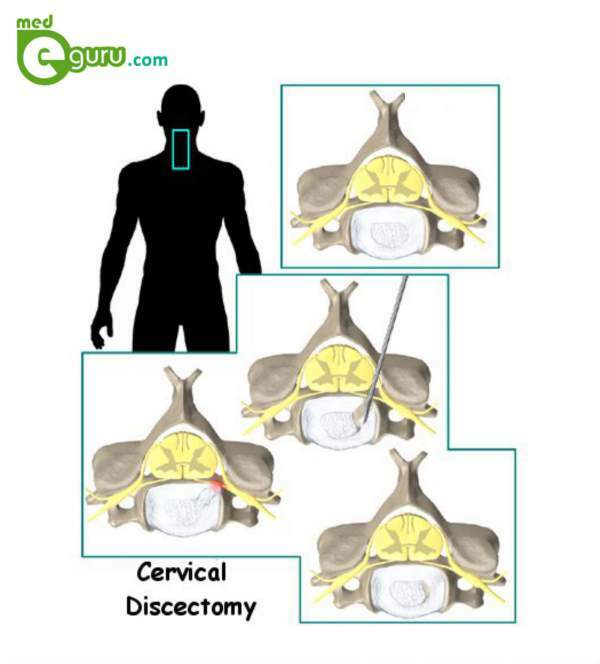 How is cervical discectomy and fusion procedure performed? Anesthesia will be given and you will be asked to lie on your back. A two inch incision will be made in the right or left side in the front portion of your neck. Using retractors the surgeon will create a tunnel to the spine by moving the muscles retracting the trachea and esophagus. The spine is made visible by lifting the muscles in the front of the spine. With the help of a fluoroscope the surgeon inserts a thin needle in the area of the affected vertebrae and disc. The vertebrae on the upper and lower part of the disc are separated using a special refractor. The outer wall of the disc is cut by the surgeon and he removes about 2/3 portion of the disc using appropriate tools. Looking through the surgical microscope the surgeon removes the ligament that runs behind the vertebrae. Any disc materials that are still remaining and are pressing the spinal nerves are also removed. Any bone spurs that may be pressing on the nerve root are also removed. If bone graft is to be made from the body of the patient itself, then an incision is made over the crest of the patient’s hip bone. Now using a chisel cut is made through the hard outer layer (cortical bone) to the inner layer (cancellous bone). This bone graft is then placed between the vertebrae.